Philadelphia based artist who had a long career spanning the late 1940’s through the early 1960’s without ever breaking through commercially, either as a solo artist or in a group setting despite being a credible vocalist and a brilliant guitarist. Historically his greatest claim to fame is as the songwriter of one of rock music’s first universal anthems. Signed to Gotham Records in 1949 Crafton was among the first notable rock guitar players yet his releases with ahead of their time fretwork drew little acclaim or sales. He wrote label mate Jimmy Preston’s immortal “Rock The Joint” which did become a hit in the summer of ’49 and three years later was done by another Pennsylvania artist Bill Haley as one of his first efforts as a rocker after making the switch from a country yodeler. Crafton was on the move himself by that time, recording for ever smaller labels along the Eastern seaboard with his group The Craftones featuring female vocalist Agnes Riley on some racy material. 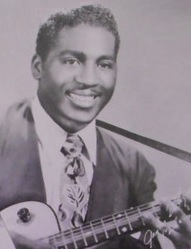 In 1954 the group with singer Melvin Smith became the Nite Riders who had some stellar releases over the next nine years on a handful of notable labels but which also failed to find an audience. After they folded sometime in the early to mid-1960’s Harry “Fats” Crafton faded into oblivion, his tangible legacy reduced to the writing credits for a song he himself didn’t even record.